On March 10, seven Chapter 1541 members and some guests departed Lincoln for Modesto for the monthly CAF Breakfast event. Pending rain and ceilings of about 4,000’ did not deter anyone (although the forecast was for VFR). None of the members except myself had attended this breakfast before so most didn’t know what to expect. ALL were VERY IMPRESSED and can’t wait to do this flight again next month. Debonair), Charlie Rogers (RV-8), Tony K (Grumman Yankee), Frank Burkhead (Remos Light Sport), Mike Moore (RV-6A), Dave Marsh (Cessna 180) and myself, Bruce Estes (RV-6). So, if you own or have access to an airplane, watch for our next flyout. 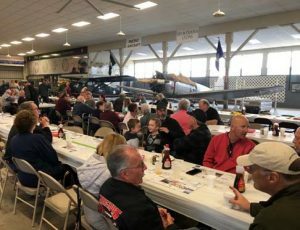 If you don’t have access to an airplane but want to attend, come to meetings and weekend events at the hangar, get involved with our chapter, meet some great people, and ask to be a guest for the next flyout. You will have fun, I promise.